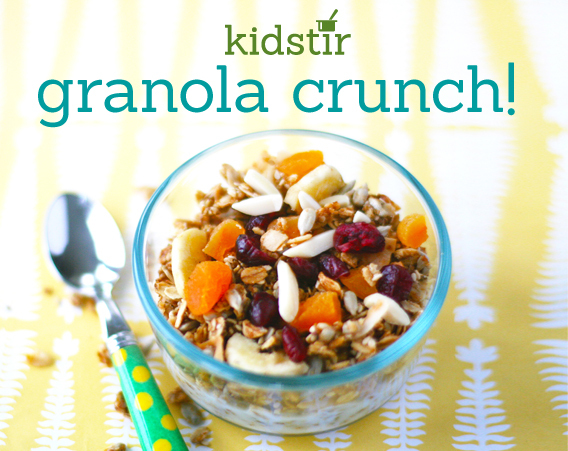 Get your kids to skip the sugary store-bought cereal–and make this whole grain granola instead. You can pick up all the ingredients in the dry food bins at your local health food store. Try the basic recipe, then get creative with stir-ins (see our list below but the sky’s the limit!). 1. A grown-up can help preheat the oven to 300*. 2. In a large bowl, mix the dry ingredients (the oats, coconut, sesame seeds, sunflower seeds, and wheat germ). 3. In a separate bowl, whisk together the liquid ingredients (the honey, vanilla, and vegetable oil). 4. Pour the honey mixture over the oat mixture and stir it all up with a big spoon. 5. Spread it out evenly on the sheet pan. Bake it for 35 to 45 minutes, stirring every 15 minutes until toasted. 6. Cool, then add one or more of the stir-ins. Store in a sealable container for up to 2 weeks. Serve with milk, yogurt, and fresh fruit.